Copying and pasting from other sources of information can result in presentations that are messy and confusing. When you copy and paste from documents or excel sheets you also copy over all the code that you can’t see and that can take up a lot of room and make your files larger than they need to be. Instead, create your presentations on the PowerPoint slides with your own text, pictures, and fonts. You don’t need to have a different text font or a different background for each slide. Use 2-3 main colors, the same font for headings and the same font for the body. If you are going to use your company logo on each slide make sure that it is not the main focus – the information should be the main focus. KISS – Keep It Simple Silly! 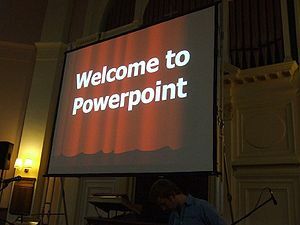 PowerPoint presentations should supplement your presentation – they should not be the whole presentation. Use points, not sentences. Use keywords so that you are only getting guidance from your PowerPoint slides. You should not be able to read it. If you only have text on your slides they can get boring. Use a picture to draw attention to a point. Use charts and graphs to help your audience visualize the information that you are giving them. Images can explain and complement your message but they should not be used for decoration. Your slide have a background and a little color in the font. You shouldn’t need more decoration than that. Every slide does not have to have a bell and whistle! If you are using an animation make sure that there is a good reason for it. When you have something really important to say that you want your audience to remember later, an animation can help you do that but if you use animations on every slide you will defeat the purpose of using them. They are not supposed to be entertainment!